Seattle Star newspaper, ca. 1940. Special Collections, UW Libraries, UW19966x. What is a Collection Guide (Finding Aid)? Collections of unpublished personal papers, organizational records, and historical photographs are described and inventoried in detailed guides known as finding aids. A finding aid helps the researcher to identify boxes or folders of interest that may be retrieved from the stacks for study. Prepared by the staff, the typical finding aid provides background information on the organization, person, or family who created the papers or photographs, an overview of the collection and its arrangement, and a detailed container list. Not all of our finding aids are currently available online. If you don't see what you are looking for, please be sure to check with Reference Services for assistance. Alumni Magazines - Both Columns and its predecessor Alumnus. These are also indexed in the PNW Regional Newspaper and Periodical index. University Archives holdings include documentation that illuminates the daily activities and special events of students at the University of Washington as well as the alumni organization and its affiliate chapters. 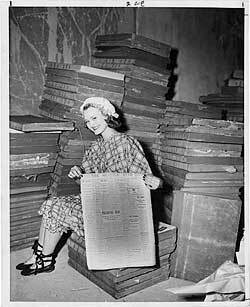 These files may encompass personal correspondence and student scrapbooks of a substantive nature; biographical material, including vitae; bibliographies, press releases, and records of student organizations; photographs of activities and social / athletic intramural events; films, audio, and video records of student performances, group projects or exhibitions; records and minutes of student government and administrative committees; diaries, notebooks, appointment calendars of student leaders, and memorabilia that reflect student life.